Finely chop the red pepper and green onions. Lightly beat egg. Mix green onions, 1/3 cup bread crumbs, lemon juice, sweet red pepper, egg, mayonnaise, garlic powder and cayenne. Drain the crab, remove the cartilage and flake it. Add to mixture. Divide the crab mixture into 8 equally-sized portions and roll into balls. Coat each ball in the remaining bread crumbs. Make patties approximately 1/2 inch in thickness. 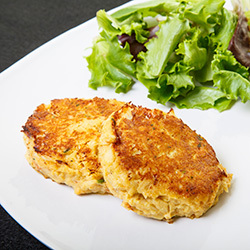 Fry the crab cakes in butter approximately 3 to 4 minutes on each side or until brown. Makes 4 servings of 2 crab cakes each.